The landslide that is known as Anthony Duclair continues to pile up the recognition as Duclair added his 2nd straight "CHL Player of the Week" award on Tuesday. This goes along with Duclair's QMJHL player of the week (2nd straight week) and the QMJHL player of the month for January as the Rangers 2013 3rd round pick continues to play some outstanding hockey for his Quebec Remparts. 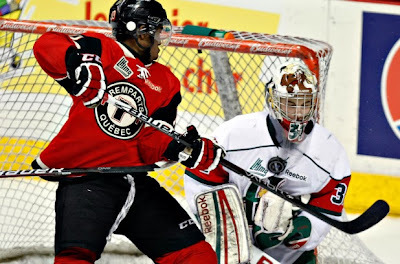 Toronto, ON – The Canadian Hockey League today announced that New York Rangers prospect Anthony Duclair of the Quebec Remparts is the CHL Player of the Week for the second straight week recording 10 points in two games including three goals and seven assists for the week ending February 2. Duclair exploded for a career-high seven points on Thursday night against the Halifax Mooseheads leading the Remparts to their seventh straight victory. He scored twice as part of the club’s six-goal second period and added five assists in the 8-2 win and was named the game’s first star with the best individual performance by a QMJHL player this season. The next night Duclair picked up a goal and two assists and received third star honours but the Remparts’ winning-streak came to an end falling 6-4 on Friday to the Blainville-Boisbriand Armada. The Remparts continue to hold fourth place in the QMJHL standings with 68 points. Duclair, an 18-year-old from Montreal, QC, is playing in his third QMJHL season with the Remparts. Selected by the Rangers in the third round of the 2013 NHL Draft, Duclair is currently second in QMJHL scoring with 85 points including a league-high 45 goals along with 40 assists in 49 games played. Duclair was in action on Tuesday evening as his Quebec Remparts were playing host to the Baie-Comeau Drakkar with a chance to cut the overall leader in the QMJHL's lead to 4 points. The game's 2nd star, Duclair had a 1-1-2 evening but his Remparts fell behind the Drakkar early and never could catch back up. It was a rough evening for Duclair as despite his own offense, Duclair was on the ice during 3 of the Drakkar's goals. This was the 2nd straight loss to a QMJHL division leader for the Remparts who now find themselves trailing the Drakkar by 8 points in the standings. Anthony Duclair with his own effort is now 46-41-87 and on a 10-12-22 8 game scoring streak. The Kootenay Ice find themselves in 5th place in the WHL's Eastern Conference after defeating the Saskatoon Blades 6-3. A huge part of that reason is Mackenzie Skapski who after stopping 28 out of 31 shots fired at him; Skapski has won his last 7 straight starts which is also the number of wins that his Ice team have in their last 10 games. It is a remarkable turnaround for the Ranger's 2013 6th round pick as Skapski struggled for most of the first half of the season. Skapski is now 18-13-2 with a 2.80 goals against and Save percentage of 0.915 save percentage. Ryan Graves (NYR 2013 4th) was scoreless but a +2 and had 3 shots as his Val-d'Or Foreurs defeated the Cape Breton Screaming Eagles 4-2. The win allowed the Foreurs to move into the 6th spot in the QMJHL standings. Kyle Burroughs (NYI 2013 7th) was scoreless, a -1 and took 2 minors of which 1 was converted into a power play goal by the Medicine Hat Tigers who defeated Burrough's Regina Pats 4-1. The loss kept Regina from being able to move up to 6th place in the WHL's Eastern Conference standings. Adam Tambellini (NYR 2013 3rd) and his Calgary Hitmen paid the Victoria Royals a visit and left the hosts with a nice 7-2 win. The Hitmen fell apart in the 3rd period allowing 4 goals to break what was a close game wide open. Tambellini was scoreless and a -1.